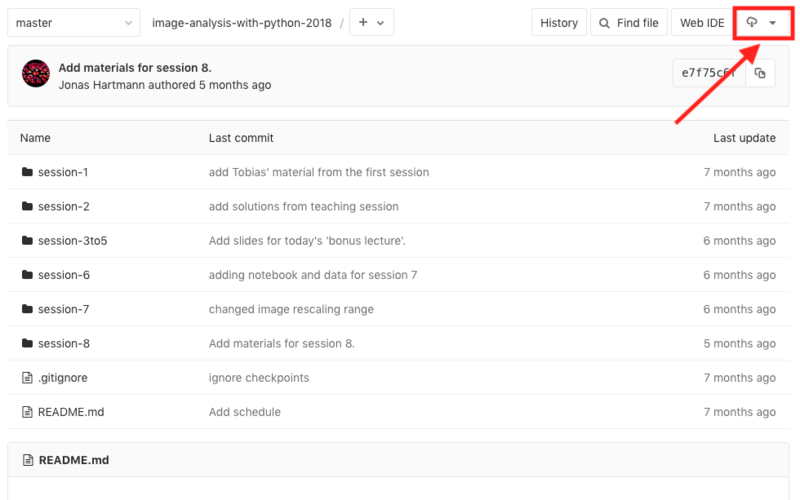 If you’d like to download teaching material from a project on GitLab or GitHub, but you aren’t yet familiar with the command line program, Git, which can interact directly with these systems, you can use a button on the project page to save a complete copy of all the project’s files to your computer. On GitLab, you can use the button containing a cloud logo. On GitHub, use the large green “Clone or download” button. You will need to decompress the downloaded file, which will create a folder containing the course material. Many of the entries in this list include links to the homepage and/or a PDF of the course materials. The majority of these links lead to pages/documents within the EMBL GitLab system. GitLab is an open source platform for management and sharing of software projects, providing users with many helpful features for collaboration and version control of files as they develop new programs. Systems like GitLab and GitHub have become popular also for people who develop training materials and documentation because many of the features they provide for software development are also useful for other “flat text” files. In 2015, two members of the Bio-IT community, Holger Dinkel & Grischa Toedt, worked with members of EMBL’s IT Services to setup a GitLab system for EMBL, hosted on a virtual machine inside the EMBL network. The system continues to be maintained and administered by volunteers from the community.